"We've had a letter about the name." And so it (probably) went in the mid-nineties when Concrete Records called Richard Maguire and Tim Holmes - aka 'Dead Elvis' - into their offices for a quick chat. Formed in 1994, Dead Elvis were still honing their eclectic electronica sound and preparing for a debut album release when the Estate of Elvis Presley dropped them a quick note/threat of devastating legal action. The duo soon obliged and Dead Elvis became Death in Vegas, using their former name as the title of their 1997 debut LP. Line-up changes and a subtle shift towards a rockier sound preceded the follow-up, 1999's 'The Contino Sessions', and it found an audience. Especially album opener, 'Dirge', which featured in a Levi's jeans ad, the sequel to the Blair Witch Project and the Brian De Palma movie 'The Black Dahlia'. Another two records followed until Death in Vegas went on something of an unofficial creative hiatus, to be broken by a fifth studio album, 'Trans-Love Energies', which is set for release on 26th September. The band will tour the new record in the UK in December, beginning at King Tut's Wah Wah Hut in Glasgow on 3rd December, followed by Leeds, Birmingham, Manchester, Cambridge and others, before the final show of the run at London's Electric Ballroom on 15th December. We will have tickets for all dates when they go on sale at 9AM on Friday 12th August, priced £13.50 (£15 for London). 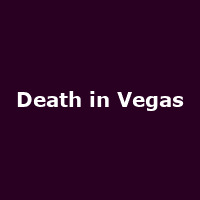 Ahead of the winter dates, Death in Vegas play the Wedgewood Rooms in Portsmouth on 18th August. We have tickets available now priced £12.